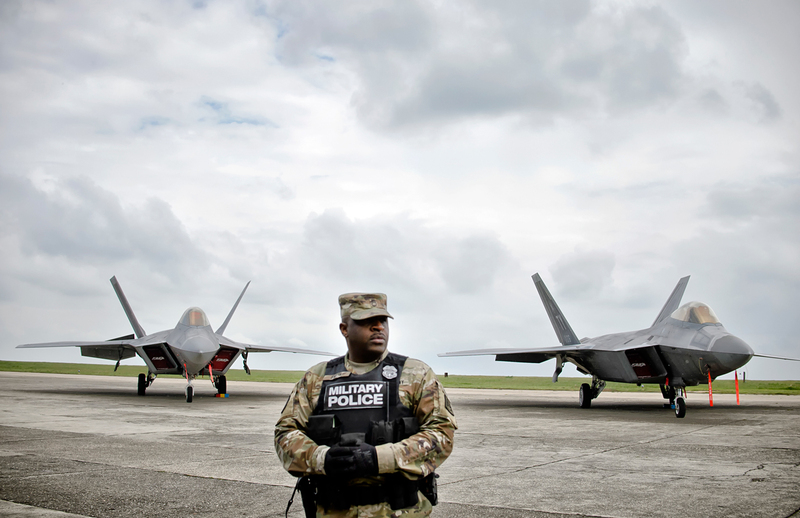 A US military policeman stands in front of U.S. Air Force F-22 Raptor fighter jets that were flown to the Mihail Kogalniceanu air base, near the Black Sea port of Constanta in southeast Romania, on April 25, 2016. In 2020, the United States will begin production of the new B61-12 tactical nuclear gravity bomb as part of a program to update its nuclear arsenal. Russian observers share their views on the new weapon and whether Moscow needs to respond. The U.S. is preparing to modernize its tactical nuclear arsenal in Europe. From 2020, it will start replacing the existing B61-3, B61-4, B61-7 and B61-10 bombs with the upgraded B61-12. As the TASS news agency's military expert Viktor Litovkin told RBTH, the main distinguishing quality of the new model is the ability to control the explosion. Pilots will be able to remotely detonate the charge, depending on the task – whether the targets are en route to the enemy's territory, on the ground or even underground. The Kremlin has so far refrained from making any harsh statements about the plans to upgrade tactical nuclear arsenals in Europe. Presidential spokesman Dmitry Peskov said the need for Russia to respond to Washington’s actions must be assessed by military experts. "The B61-12 is a tactical nuclear free-fall bomb with a yield of 10 to 340 kilotons, depending on the target – “live” troops in the theater of action or settlements and missile silos,” Litovkin told RBTH. Fifth-generation F-22 Raptor and F-35 Lightning II fighters, as well as A-10 Thunderbolt attack aircraft and multipurpose F-16 fighters will be used for striking targets. "At present, the earlier models of the warhead are deployed at the U.S. Air Force bases in Germany, in the Rhineland-Palatinate region and Büchel, as well as in the Netherlands, Italy, Belgium and at the Incirlik air base in Turkey," said Litovkin. According to Litovkin, the power of “Little Boy,” the atomic bomb dropped by the U.S. forces on the Japanese city of Hiroshima on Aug. 6, 1945, had a yield of about 13-18 kilotons. More than 150,000 people were killed in the explosion. "The bomb called ‘Fat Man,’ which was dropped on Nagasaki, claimed over 80 000 lives," he said. "And all this does not include the victims of radiation sickness. Now imagine what the new warhead of up to 340 kilotons is capable of." According to Vladimir Dvorkin, a chief researcher at the Institute of World Economy and International Relations, the modernization of U.S. tactical nuclear weapons is a routine process that does not pose new threats to Russia's security. "Any weapon has a finite expected service life," he said. "In this case, the scheduled replacement of aging warheads with new upgraded designs will begin." As he noted, the atomic bomb in the hands of civilized nations is a weapon of deterrence, rather than attack. "The Americans are replacing the B61 in order to forget about the need to upgrade tactical nuclear arsenals in Europe for decades," Dvorkin added. According to Russian observers, Moscow will not take any new military countermeasures in response to the U.S. program. "Russia is pursuing a scheduled modernization of both nuclear forces and air and missile defense systems," said the Izvestiya daily's military analyst Dmitry Safonov. "Such measures help translate the efforts of the military component of the problem to the diplomatic one." As he recalled, there is no international agreement between Moscow and Washington that regulates the quantitative and qualitative capabilities of tactical nuclear weapons. The only agreement that is currently in place is New START (Strategic Arms Reduction Treaty). Under this treaty, Russia and the U.S. agreed to reduce the number of deployed missiles and bombers equipped for nuclear armaments to 700 and the number of strategic warheads to 1,550. "New Russian and U.S. nuclear gravity bombs become highly accurate and are specialized for specific military tasks," said Safonov. "Warheads are increasingly easier to operate, and this enhances the possibility of their use in local conflicts." He noted that the issue of specifications of tactical and strategic nuclear arms could be the basis for a new agreement on the reduction of offensive weapons.